Building – Iwamura Atelier Inc. Recent change of the newspaper’s role, due to the tremendous development of information society, the function of distribution center has been changed as well. After the through research about such, a new model form of center has been proposed and interpreted into an architectural solution that can contribute to the cultural activities of the district. 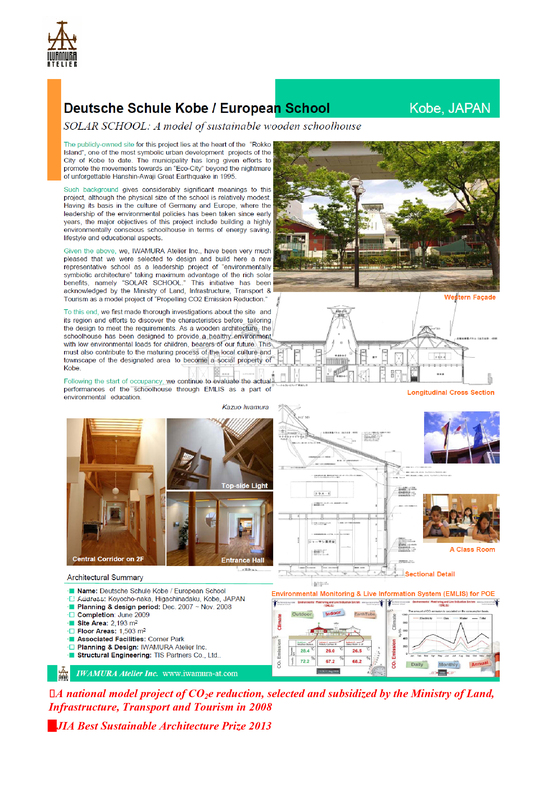 As a case study of the ecological housing research group in Honjyo since 2000, this shop-house was designed by IA and built by one of the local memer builders after the open tender. The whole process was organized and conducted by IA. This is the main pavilion of the regional exhibition “City in Forest” to welcome a part of the metropolitan functions in the natural environment. The unique wooden construction covering the stepping topography was designed to be relocated for permanent use after the temporary exhibition. This dental clinic is located on a slope in front of a street of heavy traffic and built by a hybrid structure of RC and timber. Independent from the conventional clinic image, IA gave efforts to create a harmony with the surrounding environment and thus comfort for both patients and doctors. This exhibition objects were developed and built to spread the idea of environmentally symbiotic housing within the Japan Mirai Science Museum. Techniques, mechanism, culture and lifestyle were comprehensively exhibited in terms of historical backcasting methods. As the center facility of the Agricultural Village, a variety of activities regarding the art and food culture are provided to be able to experience the local industry, techniques, skills and traditional culture. 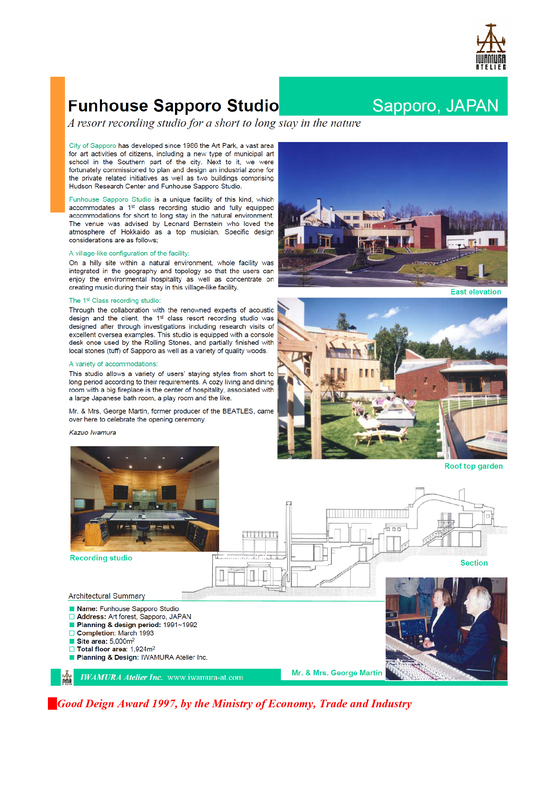 IA elaborated not only the architectural design but also the related programs. This is a environmentally symbiotic training center of an advertising agency having its headquarters in Ginza. Located in the Shonan International Village, this center was integrally designed with the surrounding hilly nature by the sea, to be enjoyed by the accommodated employees in sharp contrast to the headquarters in downtown. 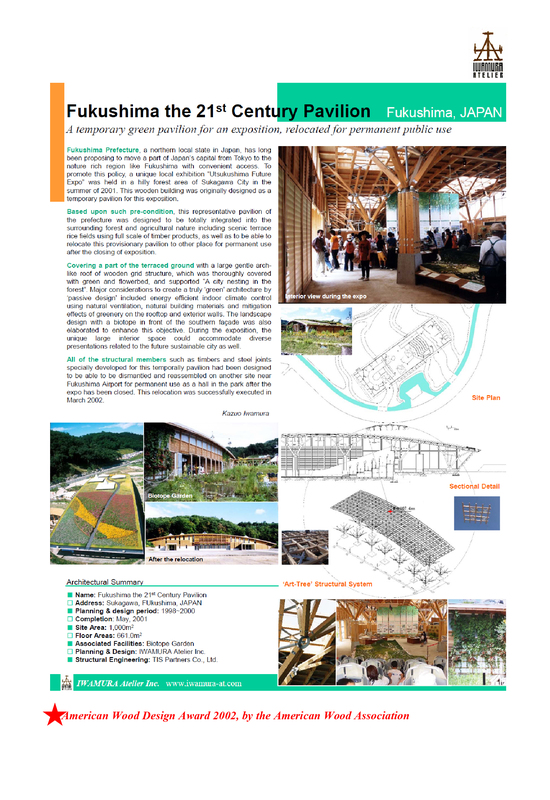 A variety of exhibitions comprising visual arts regarding the environmentally symbiotic urban space for Tokyo, which was taken place in the Luvre Exhibition Hall in Paris. IA was assigned by the Tokyo Metropolitan Government to plan, design and execute the whole exhibition that was highly appreciated by the visitors. This is the research center of a computer software provider, associated with a historical coin museum of its collection. From the beginning of the site development, IA was assigned to elaborate the whole project, the theme of which was Art-Information-Ecology. To improve the thermal condition of a traditional wooden house, a large greenhouse has been inserted into the site taking advantage of its passive solar principle and a hybrid space development. This is a comprehensive research center on food, life and mind comprising the related facilities including office, laboratory, hall and restaurant. It contains a variety of spaces integrated into a hill to create an attractive landscape along the circulation. A small wooden shop house, located in a resort area near Kuroiso, which was awarded by the 1st “SD (Space Design) Review”. Using traditional timber building method, implicit meaning of cited form was elaborately expressed in it. Actually this is the 1st architectural work of IWAMURA Atelier after the establishment.